The world started down a new road in 1997 when the first modern hybrid electric car, the Toyota Prius, was sold in Japan. Two years later, the United States saw its first sale of a hybrid, the Honda Insight. These two vehicles, followed by the Honda Civic Hybrid, marked a radical change in the type of car being offered to the public: vehicles that bring some of the benefits of battery electric vehicles into the conventional gasoline powered cars and trucks we have been using for more than 100 years. In the coming years, hybrids can play a significant role in addressing several of the major problems faced by the United States and the world today: climate change, air pollution, and oil dependence. Whether this new technology delivers on its promise hinges on the choices automakers, consumers, and policymakers make over the coming years. Poor choices could result in hybrids that fall short even of what conventional technology could deliver on fuel economy, emissions, or both. If they are designed well, these hybrids can equal or better the utility, comfort, performance, and safety we’ve come to expect, while saving us thousands of dollars at the gas pump. The Honda Civic Hybrid and Toyota Prius are good examples of the current potential of hybrids but they’re just start. More technology is ready to be put to work and not only for compact cars. This study provides a broader picture of how hybrid technology could transform the whole passenger fleet both within this decade and into the next. A fleet of cars and trucks that takes full advantage of hybrid and other advanced technologies could reach an average fuel economy of 60 mpg, as Figure shows. Even conventional technologies could boost the passenger vehicle fleet average up to 40 mpg. And all the hybrids examined in this study can meet today’s most stringent standards for tailpipe emissions 2 (excluding the zero-emissions standard). The study’s key findings are outlined below. • A fleet of passenger cars and trucks using conventional technology has the potential to reach a fleet average of 40 mpg. The average vehicle in this fleet will cost about $1,700 more in the showroom, but will save consumers $3,800 at the gas pump over the vehicle’s 15-year life for a net savings of $2,100. • A fleet of mild hybrids can reach nearly 50 mpg, with a retail price increase of about $2,900 by using advanced technologies available to automakers within this decade.3 Lifetime gasoline savings will amount to $4,700, producing a net savings of $1,500 for the average driver when the cost of battery replacement mis included.4 Mild hybrids that use more moderate technology or smaller motor/battery systems will achieve lower fuel economy and will be less cost effective. 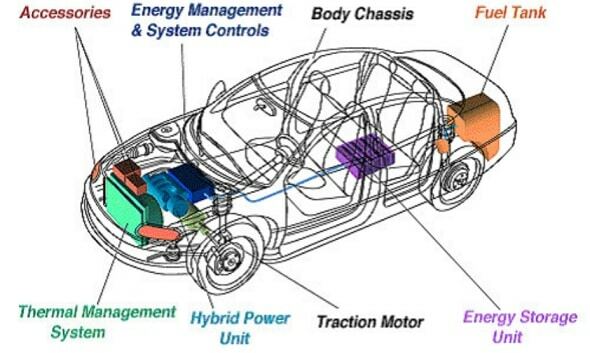 A hybrid electric vehicle (HEV) is an optimized mix of various components. View a typical hybrid configuration in the diagram below and learn more about the various HEV components by following the links below. To help reduce emissions and improve vehicle efficiencies, these systems and components are being improved through research and development. A spark ignition (SI) engine runs on an Otto cycle—most gasoline engines run on a modified Otto cycle. This cycle uses a stoichiometric air-fuel mixture, which is combined prior to entering the combustion chamber. Once in the combustion chamber, the mixture is compressed, then ignited using a spark plug (spark ignition). The SI engine is controlled by limiting the amount of air allowed into the engine. This is accomplished through the use of a throttling valve placed on the air intake (carburetor or throttle body). • A century of development and refinement: For the last century, the SI engine has been developed and used widely in automobiles. Continual development of this technology has produced an engine that easily meets emissions and fuel economy standards. With current computer controls and reformulated gasoline, today’s engines are much more efficient and less polluting than those built 20 years ago. • Low cost: The SI engine is the lowest cost engine because of the huge volume currently produced. The SI engine has a few weaknesses that have not been significant problems in the past, but may become problems in the future. • Difficulty in meeting future emissions and fuel economy standards at a reasonable cost: Technology has progressed and will enable the SI engine to meet current standards, but as requirements become tougher to meet, the associated engine cost will continue to rise. • Throttling loss lowers the efficiency: To control an SI engine, the air allowed into the engine is restricted using a throttling plate. The engine is constantly fighting to draw air past the throttle, which expends energy. • Friction loss due to many moving parts: The SI engine is very complex and has many moving parts. The losses through bearing friction and sliding friction further reduce the efficiency of the engine. • Limited compression ratio lowers efficiency: Because the fuel is already mixed with the air during compression, it will auto-ignite (undesirable in a gasoline engine) if the compression ratio is too high. The compression ratio of the engine is limited by the octane rating of the engine. • Typically, 80% of the combustion energy is wasted as heat.